Rule #1: If I don’t know you, I’m not picking you up. All other rules: refer back to Rule #1. My days of picking up people on the side of the road are gone. Even when I did, the times were rare because I was picky. I could judge them by their appearance. Do you want the ride or not, you ungrateful mooch? If they looked like they needed a shower, the answer was no. If it was raining, no. In the dark on the side of the highway. And if I was on a schedule, the answer was no. Due to my rules, most of my experiences with hitchhikers have been pleasant. Thumb out not realizing she was that close to the yellow lines. Led to parties where I met some pretty cool folks. I have never spent time on the side of the road? Well, that assumption would not be correct. When we ran out of gas or slid into a snowbank. Extreme likelihood that they could freeze if not. When a pump in my car decided to die. I thought about sleeping in my car. It was not warm, either. But even I had had a cell phone, I was sure to be in a dead spot. A semi-truck going the opposite way was the first to stop. In the dark going the wrong way. And asked me what the situation was. Calling the next truck coming north. A companion about the same age of his daughter back home. I had never ridden in a big rig before… Way cool. This time in the comfort of my mom’s car. The coolest hitchhiker experience I’ve had was in Canada. To Alaska where both of us were going to work for the summer. Deciding what we were going to do. Two kids on the side of the road with the car doors open and license plates not from Canada. He called his friend who came and picked us up with a tow truck. He also called his son who came to pick us up from the garage in his green Camaro. Fresh lobster flown in from Newfoundland earlier that day! And passed out in a pop up camper, taking shots and laughing. My car was done before noon the next day. We thought about staying another day. We would not make it to work if we lollygagged any longer. Before the next dot on the map. We drove into my driveway so early in the morning that it was still dark. We showered, got back into the car and drove to our first day of work. While we drive to a location that is most likely not where I am going. Is not a drunk on a beer run who believes he deserves the ride. Trying to take it as a challenge. Makes me contemplate the quality of living. So it suffocates with a reddish hue and makes me think the world is on fire. Helicopters beat the ground they fly so low. Civil Defense flyovers, looky-lou VIPs and tourists have the route on repeat. Break the monotony of songs and ads on the radio. She’s six. All she really understands is she moved schools because of the lava. My eyes well up with thoughts of my old routine that included Pahoa. But this gray haze cuts the world off at the next line of trees. Just opaque color and itch. Some small part of me is thankful for the vog because it brings the lava to everyone’s attention. Because they’ll be the only ones affected. My, my, what a difference twenty miles makes. When the lava crosses the only civilized highway. It’s clear she’s not done yet. Hoping for the fits of a native Hawaiian goddess to end. Our elf didn’t stand a chance. He was given to me by a friend so he didn’t come with the box that had the instructions. Being a vintage elf, he has the most expressive rosy cheeked smile and special light in his eyes, but being vintage, his arms are connected and he doesn’t sit that straight. With my instinctual procrastination, the Christmas boxes weren’t cracked until the third of December. The advent calendars were filled late. We barely had enough time to grab the Santa hats before it was the annual town Christmas parade, and then it happened. I was opening one of the Christmas tins that hold ornaments and such in the off season and cookies and things in the season, and I unwrapped our elf with the kids less than ten feet away. With my bent understanding of elf of a shelf, having learned everything from looking at the box on the shelf and hearing snippets of rumors that he did this or he went there, I knew that the kids weren’t supposed to see me take him out of the Christmas boxes. I swear my daughter looked up at me and saw him, but without a skip in my heart, I turned around and lackadaisically put him up on the mantle between some of my husband’s big shiny trophies. With a wonder in my head, I turned back around and picked up an ornament from a tin to give to my daughter for the tree. Like so much of parenting, it was just like magic. That night after dinner, when my daughter looked up and said, “What’s that?” pointing to the smiling little Christmas cherub, fantastical stories gripped me. With flourish I told the kids about the Christmas elf who is their direct line to Santa. Santa is always watching, as we know by the song, but this elf is the extra security to make sure both good and bad behavior is reported. The questions from the kids started coming and, like balls flying at the best World Series, my husband and I kept batting ‘em into the stars. This elf flew to Santa every night, faster than a blink of an eye, but he always waited until you’re sleeping. He moves to a new place in our house after he comes back from telling Santa and that’s how the kids will know that Santa knows. Pure clueless gold! Who needed to know the official rules of the elf on a shelf? Surely not our house! We had to name the little guy and anyone who has small children in the house knows what “great” names come up. I was wondering with small dread what hideous name this great face would have to be called for the rest of his life. Buddy first came up, Chalmers was a friend’s elf’s name and then my daughter shouts out, “Zippy!” The appropriateness of it settles over us since he does have to be quite fast. She lets out one of her infamous guffawing laughs and blurts, “Zippy Wippy!” and melts into peals of joy. So Zippy’s stories began. Starting simple, I moved him around without much outside influence. On top of the bookshelf, on the shelves of the bookcase, on a tree branch up by the angel, on a boat decoration on the tree, up on the kitchen cupboards and once inside the KitchenAid bowl as if waiting for the next batch of Christmas cookies. He got quite brazen when he slipped inside my daughter’s stocking on her birthday. There were a couple of times the kids pointed out that Zippy may not have reported to Santa because he didn’t move overnight, but I reminded them that Zippy also had to make sure they were on their toes doing their duty and watching out for him. There was a notable uptick in their behavior on a few occasions when it suited one or the other well and put the other in a bad light, so that worked out well in the parental arena. I saw crazy pictures of other elves videoing Barbie and her friends as they soaked sink side, making number two in the form of kisses on those peanut butter shortbread kiss cookies and one deplorable elf passed out with a straw in hand after making a coke line disappear! Oh, to the detriment of the season, and you better believe I never showed the kids such behavior. Now that the new year has rounded the corner and the Christmas decorations are still up, Zippy has stopped moving and was in what appeared to be his favorite spot up by the angel on the tree. Tonight he fell off of his branch. I picked him up so gingerly and brought him down so they kids could ooh and aah over him. Then they told me to put him back up in the first place they found him- up by Daddy’s big shiny trophies on the mantle. Christmas magic is clearly still hard at work, though the wrapping paper and tags have been thrown away. For this upcoming Christmas, I may actually research a few scenarios for our adventuresome elf on a shelf. There were other things that I could have done, but didn’t want to. I dug in the deeps and gathered all the supplies. 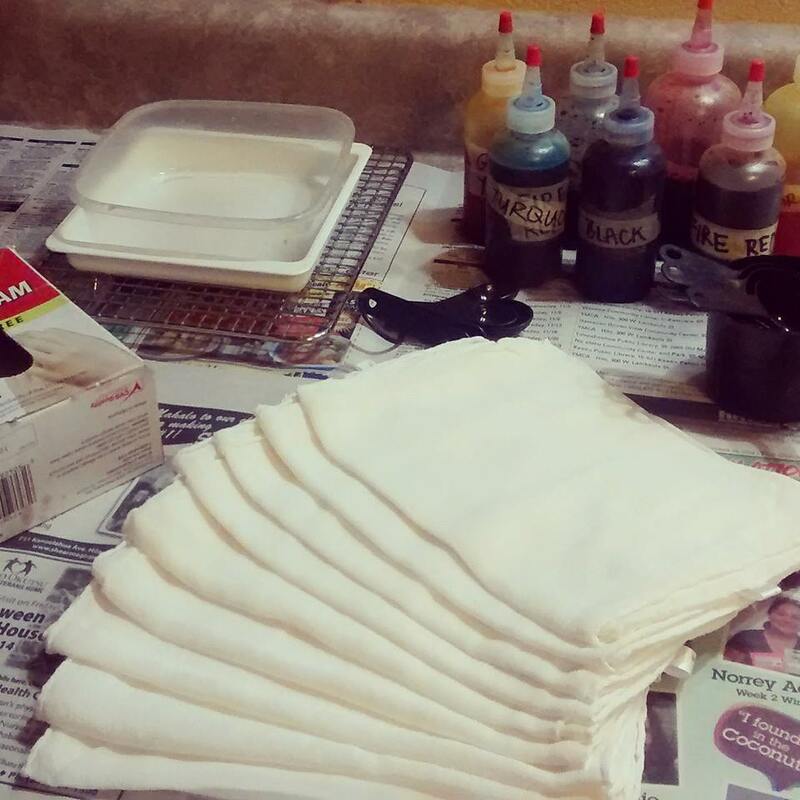 I was surprised it all came back so fast considering how long it’s been since I’ve dyed or batiked anything. Making sure to snap a picture before I took off on my color adventure, I felt proud and confident on my move to sweep everything from my schedule. 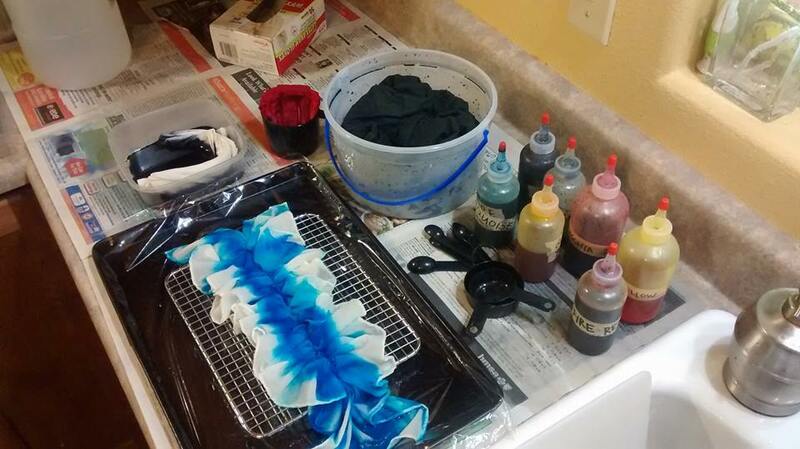 It probably took an hour to get the first scarf in a dye bath. I messed around with a latticed cooling rack but it was more of a struggle than I expected. I made two small tears in the scarf so I started folding. I must have folded and re-folded that wet silk a dozen times. The ideas were grandiose pictures in my head. I couldn’t get that lattice work picture out of my head, so I went back to the cooling rack. I finally got three scarves where I wanted them. Since it’s been so long, I kept the colors straightforward- turquoise, fire red and black. I put the last item into its dye bath and paused for lunch. Rinsing the creations can be exhilarating but also can be a letdown. The turquoise scarf was the one I ripped so I was almost hoping it wasn’t too cool. It wasn’t but I gained some insight on how to make it better next time. The fire red scarf came out pink as I had half expected it to but the creases I had hoped would be crisp and clean came out somewhat muddled. The bleeding and blending of the colors redeemed it a bit. The prize of the day came from the black geometric starburst scarf. I follow a method from a book called Dyeing By Accident by Ann Johnston. By using less water than the usual full immersion dye baths, it allows the colors to bleed and even separate. It is truly the best lesson in color theory because it shows me what colors make up other colors. I’ve also started a Dye Journal to track my folds and record thoughts for future renditions. It is probably the most important tool in my bag of tricks right now. There are many things I can work without, but without a log of how I’ve done things, I’m always starting over. I will probably need to add pictures at one point or another but everything is a work in progress. The end results weren’t as prolific as I’d hoped, but the feeling I had rinsing my creations made it totally worth it. Progress in a creative avenue is what I needed on this day rather than another trip into Hilo. 1. Preheat oven to 350°F. Line two cupcake pans with liners and spray with non-stick stuff. 2. Combine pumpkin, evaporated milk, eggs, sugar, pumpkin pie spice and salt in a large bowl. Stir until well blended. 3. Pour mixture into the cupcake tins, being aware of that 3/4 full rule you see everywhere. 4. Sprinkle dry cake mix fairly heavily into each tin. I had approximately 1/3 of the cake mix left. 5. Drizzle just a smidge of butter into each pie. The butter will run to the edges and not soak in or stick to anything but that’s okay. It all works out in the end. 6. Bake for 12 minutes. Remove from the oven, sprinkle nuts on top. Your pan is gonna look like a nightmare. Just keep going. 7. Cover with foil any way you can because the pans are hotter than hell. Other recipes don’t call for the double bake or the foil but the pictures are also quite a bit more brown so I’m sticking to this technique. 8. Put back into the oven for another 8 minutes. 9. Cool completely and try not to eat more than three.